from leaves we don't want them to eat, which wouldn't bring a smile for sure. But since this is the only one I've ever seen, I guess we don't have a leafhopper problem. and it's like playing Where's Waldo. I know they're there somewhere! So, where are those chickens, anyway? On a hot day they're often gathered under anything shady. If you look carefully you can see several of the girls. Some girls aren't predisposed towards hiding or blending in, though. Like Big Brahma Mamma just sticks right out. No matter what she tries to do. she likes to play hide and seek! then I can't really see her! Substantial enough to juggle with. unless you have plenty of eggs to spare and don't mind a mess. Bootsy is a very good juggler and even she made a big splat! The dogs always have fun licking up our egg mishaps, though. we'd like to know how our girls' eggs hold up to the industry standard. So I splurged on this Kuhl Jiffy chicken egg scale. It looks simple and fun enough. and eggs that big also won't fit into a carton. Soon we'll know how our homegrown eggs rank! I've also been reading a bit about "grades" of eggs. I thought "grade A" had something to do with size, but it doesn't at all. I'm sure our totally spoiled and wonderful chickens produce grade AA. is so far superior to the commercial / factory setting. Grade A, a notch below AA - is what is typically sold in mainstream supermarkets. but instead they're sold as miscellaneous 'egg products' such as whites in a carton, and in commercial applications (think processed foods), etc. You'll figure out why if you take a listen. of our 7 little hens! so it's nice for her to have a protective friend! with a microphone and do her best Elvis impersonation. Then there's Buffy (the queen) and Specky, our Americauna. Don't they look like they're at a dance party?! They USED to pair up and sleep side by side at night, too, just as shown here. that is never ever going to hatch any chicks because we don't have a rooster! it's going to be an immaculate conception of some sort. I haven't seen him sneaking into our chicken yard. so I guess you just never know. so maybe by now they have Michelle! Stay tuned for more to come about brooding behavior. check out Ruth Creates on Etsy. live at montreaux jazz festival in '80. just makes me want to dance! and dancing makes housework really fly! i love all your places to sit and just be. that make me feel free. or lie down and dream for part of the day. that protect me from the sun. to give water and love. it's ready to get up and go! some light plates, bowls, and cups. with that lady of mine. and down our eager throats. that you're here with us. every passing minute of you. You've got to take care of your feet. all day, day after day. And it's not just "weight." your feet should be treated well for the job they do every day. but you should really love on your feet. Get thyself to the Aurora Shoe Company! hand-made goodness that will mold to your feet. Separate, yet one with each other. Things just fit together like they were meant to be. So cliche, but so true. getting their shoe groove on. It's sort of like an art studio. Keeping the old arts alive while breathing new life into them. It feels good to support local people in what they do. for something handmade every inch of the way. Looks like this Singer has seen a lot of days, which is how it should be. and meant to last for lifetimes. There was no planned obsolescence. No 'protection plan' sold at the checkout. There are so many reasons to GO to them rather than ordering online, if you can. First of all, the vibe is awesome. It's such a beautiful thing to see real people keeping real and meaningful skills and traditions alive. Oh yes, and did I mention they're half price at the store??? i love the word dicentra. i also love the word spectabilis. and settle them on your face. oh such a romantic perennial. since we met in may... 9 years ago! these are the two varieties we have in our gardens and they're so sweet. two very winning character traits in flowers, if you ask me! they bloom may-june, so they're on their way out now. the weight of so many years. through our gigantic pile of compost and soil mix. i can catch it and save myself some shoveling. and yet here it is! I love how the young bud looks almost like an onion skin. and every petal is free. They reseed themselves. They have a gorgeous little flower. They're bountiful and lush with absolutely no maintenance. You can pluck the blossoms and peel them apart into little strands. kind of thing you might want to have a little oniony flavor. You can do the same thing with the green stems, of course. heart burn like the latter sometimes do. unless you want your eggs to taste a little oniony! who could call such a beautiful flower a weed? Dandelions are nothing short of amazing. Some people hate them, but I know better. from her yard for dinner, rinsing them in the collander in her old porcelain sink. There's so much more you can do with dandelion than just eat the greens, though. You can dig up the root and use it to make a tincture. You can pop off the blossoms and make dandelion wine. You can make dandelion vinegar, dandelion oil. 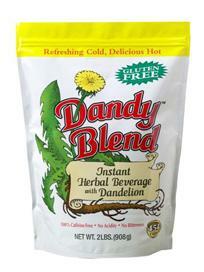 And there's an amazing tasting drink Sasha introduced me to, called Dandy Blend. And dandy it definitely is! and sometimes in the morning, too. Gotta try it with milk. You can get it online, or if you're a local, it's in Greenstar near the coffee.